1. To keep things cheap the dollar store sells smaller units of food. So instead of 8 ozs of tuna, the dollar store will sell 4 ozs. if you’re getting meat, its going to be a thinner cut and have fillers. 2. There isn’t a huge difference in terms of health or nutritional content between like products at the dollar store and places like Wal-Mart. 3. Dollar store items aren’t as flavorful. For example spices from the dollar store can taste flat. Bennet’s conclusion: the dollar store has some good deals, but you’ll need to go to a regular supermarket or a farmers market to get everything you need. The upside is stuff is super cheap at the dollar store, so you even if the taste isn’t that great its balanced out by the low low price. 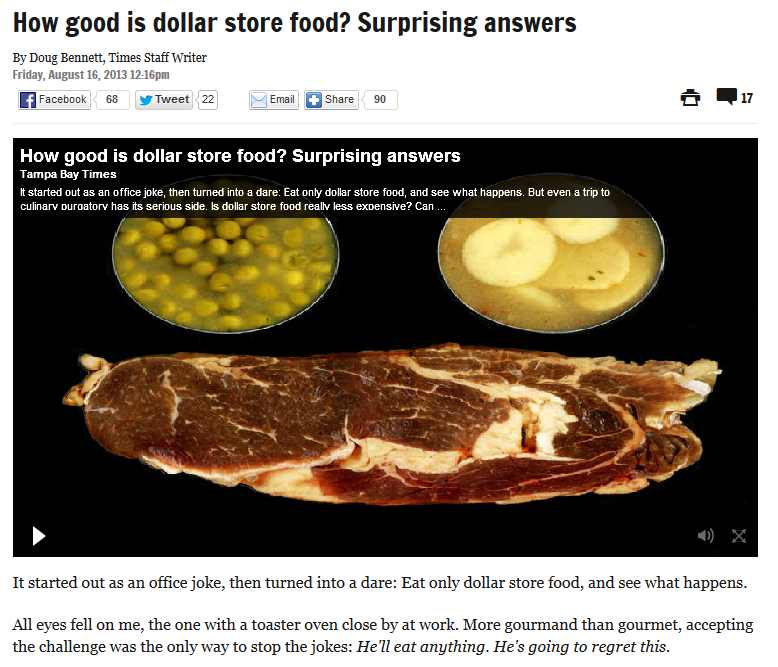 His article also gives some great recipes you can make for like 5 bucks with dollar store ingredients. For more check the rest of the article here. Greg, bad editing on my part. Just fixed the link. Thanks! Next post: Do you do everything with your spouse?